All the Right Moves | God has your back! 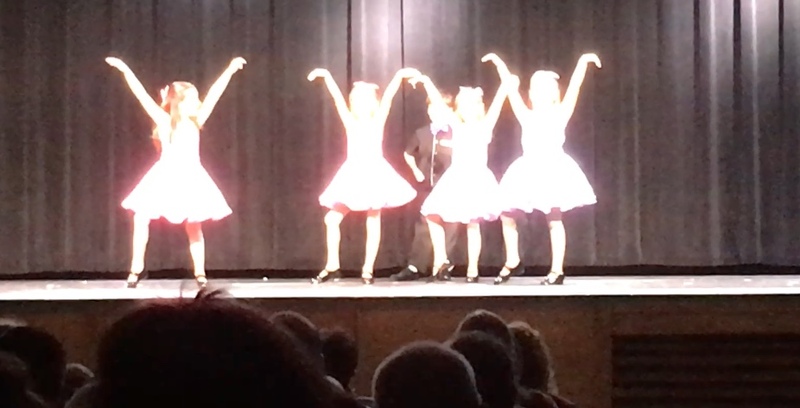 We went to see the granddaughter’s Christmas dance recital last week and it was a lot of fun. The girls looked beautiful and did a great job. We are so proud of them! I just wish my pictures would have turned out a little clearer. The recital included a lot of performances by kids of various ages, from preschool all the way up to high school. The little ones were especially fun to watch. They are so cute! I love how some of them wave at the crowd during the midst of their performance and even give a shout out to Mom or Nana during the song. One thing that was also consistent with the little ones was the way they kept looking to the side of the stage so they could watch their teacher. By keeping their eyes on their teacher they were better able to remember the next moves and the steps they were to take during the song. The older kids didn’t really have to look to the side of the stage as much. They were more experienced and had already spent enough time with the teacher, practicing the right steps and learning the right moves so that it came pretty naturally during the song. As I reflect on these things, I see a good correlation to our spiritual lives. All of us get lost in the music sometimes and aren’t sure what steps should come next. We can easily find ourselves making the wrong moves or not being where we need to be. Those are great times for us to remember to look to the Lord for guidance. We are told in Hebrews 12:1 – 2, “…Let us run with endurance the race that is set before us, 2 fixing our eyes on Jesus, the author and perfecter of our faith…” Our Lord knows the steps we should take and the moves we should make during each and every song. He is the author and composer of all things. He will teach us and He will guide us if we look to Him. May we always look to Him. And may we spend enough time in His presence so that the right moves and the right steps will come more naturally to us. This entry was posted in All the right moves, Christianity, Church, following Christ, grandchildren, Hebrews 12:1, Hebrews 12:2, ministry work and tagged All the right moves, Christianity, Church, faith, God, grandchildren, Hebrews 12:1, Hebrews 12:2, inspirational, Let's Dance, ministry work, spiritual growth. Bookmark the permalink.